Desk Report: The 14th anniversary of the gruesome August 21 grenade attack on an Awami League will be observed observed with various programmes on the day after tomorrow. 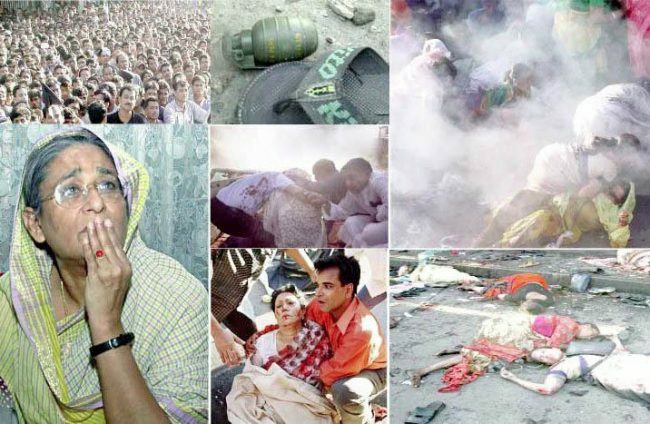 On this day in 2004, the gruesome grenade attack was carried out on an anti-terrorism rally arranged by Awami League at Banbabandhu Avenue in the city during the rule of BNP- Jamaat alliance government. The main target of the heinous attack was current Prime Minister and then opposition leader and daughter of Bangabandhu Sheikh Hasina. At least 24 leaders and activists, including Awami League’s women affairs secretary and late President Zillur Rahman’s wife Ivy Rahman, were killed and 300 others injured in the grenade attack. However, Sheikh Hasina fortunately escaped the attack unharmed but her hearing was affected badly.